These are the original magnetic photo frames. Just slide in a photo and stick it on your fridge. The back of the frame is magnetic while the front is crystal clear photo friendly vinyl. Contact us with your mailing address and request a free sample, US only, one per household please. Click on the product image or name below to shop for that item. Free US Shipping on this style of frame. Our best value magnetic soft pocket frames. Clear vinyl front with a white inside and a full magnet back. Sealed on three sides like a pocket. Photos just slide in and stick to steel. Custom sizes available. Free US Shipping on this style of frame. Rigid pocket style magnetic frames with a crystal clear vinyl front and back with almost full size magnet on back. Front and back separated by a third layer along the sealed edges. Free US Shipping on this style of frame. Our first style magnetic frames. Clear vinyl front with a white front facing interior creates a thin white border around your photo. Made with a full magnet back and sealed like a pocket so photos just slide in. Custom sizes available. Free US Shipping on this style of frame. Magnetic frame with a clear front and a black front facing inside surface that creates a thin black border around your photo. Made with a full magnet back and sealed on three sides like a pocket. Photo slides in and sticks to steel. Custom sizes available. Free US Shipping on this style of frame. Just like our magnetic pockets but with only two sealed edges so you can insert larger or longer photos easily. Clear front, white front facing inside, full size magnet. Free US Shipping on this style of frame. Same crystal clear pocket as our Crystal Light Hard pocket frames but with a smaller, thicker and stronger magnet. A fine magnetic frame at a great low price. Free US Shipping on this style of frame. 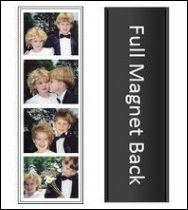 Long narrow flexible magnetic sleeve frames made for photo booth strip pictures. 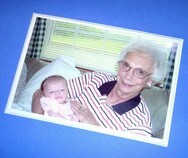 Free photo insert tool with every order makes photo insertion easy. It takes only seconds. One or two insertion tools will take care of your whole party. Free US Shipping on this style of frame. Our Instagram square magnetic picture frames allow you to quickly and easily frame your square Instagram prints. Just slide in a photo and stick it on your fridge. Flexible and lightweight - mail them to friends and family. Custom sizes available. Free US Shipping on this style of frame. 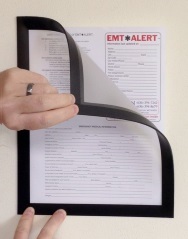 Color Brights Custom Magnetic Document Frames are perfect for lean management display boards. Super strong magnetic back designed to make changing documents effortless. Custom sizes also available. Made in USA. Free US Shipping on this style of frame. 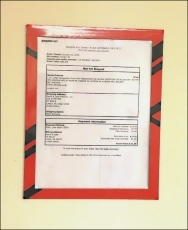 Perfect for lean management magnetic wall displays. Made to perfectly fit standard 4x6 and 5x7 photos or standard 8.5x11 and 11x17 size paper with your choice of clear vinyl, no glare vinyl or no vinyl for easy insert marking. Black or white with super strong magnetic back designed to make changing documents effortless. Priced better and Made in USA. Custom sizes available. Free US Shipping on this style of frame. Made for most paper sizes with clear write on wipe off vinyl surface. Colorful border with super strong magnetic back. Designed to make changing and displaying documents effortless. They can be used either horizontally or vertically. Use the same frames throughout your buildings for continuity. Custom colors available. Made in the USA. Free US Shipping on this style of frame. 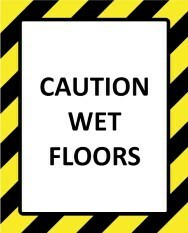 Made for standard 8.5x11 and 11x17 size paper with clear write on wipe off vinyl surface. This is the original style available in blue. See our new Fridge-Lyt Document Holders above for choice of clear vinyl, no glare vinyl or with no vinyl for easy insert marking. Colorful border with super strong magnetic back. Designed to make changing documents effortless. 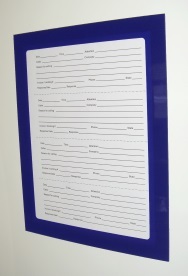 Perfect for lean management magnetic wall displays. Priced better and Made in the USA. Custom sizes too. Same great style frames as our Original Soft pocket frames but in colors of your choice. 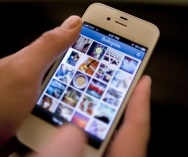 The brightly colored interior front facing surface shows as a thin colored border around your photo. Full magnetic back and crystal clear vinyl front. Assortments of prepackaged quantities of some of our most popular magnetic frames and sizes. Great savings. Great frames. Wonderful gifts and a good way to introduce the frames. Many pages for photos with a super strong magnetic back. Display it on the fridge and just wait for your visitors to spot it. It's a terrific way to display related family photos. Clear front, white inside front facing surface for a white border around the photo and a large 1 inch by 4 inch magnet on the back. Great frame at a great price. Made from overstock 4 inch by 12 inch frames. They have a huge magnet on the back and will hold very well on any steel surface. Amazing low price. A soft pocket style frame made as a magnetic bookmark. 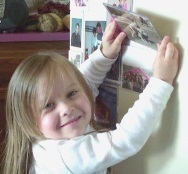 Keep your place in any book by magnetically clamping the page and always have a friend or loved one's picture handy. Just like our Crystal Light hard pocket frames but made larger to accommodate a mat around the photo in the frame. Mats can be made of any colored or printed paper. Similar in appearance to a white soft pocket frame but with a 3 inch by 4 inch magnet on the back like a Hard Pocket frame. Exceptional high quality at a special low price. These frames are a simple black or colored die-cut border for any photo. Just hold the photo against any steel surface and place the die-cut frame over its edges. They hold tightly. 2,000 piece quantity discounts on our most popular styles and sizes, up to 4 inch by 6 inch and all our Strip Photo Booth Frames.